We are a talented team of dance professionals specializing in Ballroom and Latin Couples Dance including Waltz, Foxtrot, Viennese Waltz, Quickstep, Swing, Jive, Bolero, Rumba, Samba, Cha Cha, Mambo, Paso Doble, Hustle/Disco, Tango, Salsa, Bachata, Merengue and many other dances. We would love to teach you how to dance at our Syosset Dance Studio! Private and Group Dance Classes are available for all ages. We specialize in preparing students for Ballroom & Latin Dance competitions, showcases and weddings. We offer Ballet, Hip Hop & Tap Dance classes to tone, stretch and sculpt the body & mind. Learn to use your body, dance, acting and satire to entice an audience in this alluring dance. Professional choreography designed to have any level dancer looking their best on their wedding day. Learn to Ballroom Dance, Salsa, Fox Trot, Merengue and more with an expert dance instructor. Everyone is welcome no matter your dance level for both singles and partners. We offer Ballroom, Modern and Ballet dance classes and private lessons for children of all ages. 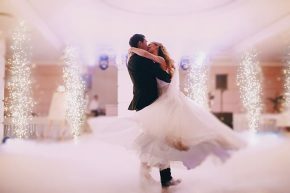 "Dance with your heart, and your feet will follow"
We offer Dance Parties, Events and Floor Rentals. Discounted packages are available, prices subject to change.